Gorgeous mission style is featured in the Amish Freemont Mission Open Desk with Optional Topper. The Freemont is simple and elegant, with decorative mission slatwork in the sides that sets off the body of this desk. The Freemont is an excellent candidate to create an office work space wherever you need it. Available in three custom sizes ranging from 54" to 72" and standing 31" high, this mission desk is ideal for a home office or bedroom, a library, or a reception or lobby area. 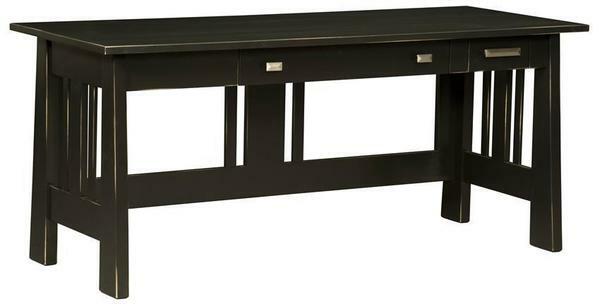 Make this mission desk just right for your space with custom options to choose from. Select the size that best fits your space. The Freemont is offered in your choice of oak, brown maple, quarter sawn white oak or cherry wood. The solid wood topper adds a delightful collection of small drawers, slots and display space on top. The addition of the topper adds another 13" to the height of the desk. I use the furniture on a daily basis. The quality is second to none.